So, we are finally home and wouldn't you know it...some of us are sick. Well, that means only one thing...chicken soup! We call it chicken soup, but really it is more like a stew. This is one of those recipes that we have made for years based on what the illustrator's mom used to make. Throughout the years we have adapted it to our tastes and I have now written it down to pass on to you. I cook the chicken myself, but you can use leftover chicken or store bought rotisserie chicken to make it easier. I hope you enjoy it as much as we do! If you are cooking the chicken, place the chicken in a large pot and cover with water. Sprinkle with a generous amount of onion powder, garlic powder, poultry seasoning, salt and pepper. Boil chicken for about an hour until it pulls away from the bone easily. When done cooking, remove from the pot. Pour water out of the pot and pour the chicken broth into the pot. Add carrots, corn and cream style corn to the pot and bring to a boil. Shred chicken while that cooks. 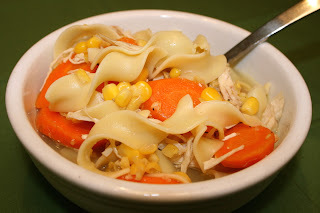 After the pot boils for about 15 minutes (carrots should be tender, but not fully cooked), add the chicken and noodles. Season with 1/4 to 1/2 tsp poultry seasoning, salt and pepper. Cook with pasta according to the directions on the package (about 10 minutes). Serve up! *As a side note...I don't always specify the amount of salt and pepper due to everyone having different tastes. I am trying to cut back on the amount of salt I take in so use it to your discretion! Mmmmm, chicken soup. The chicken stock is definitely a time saver. We used to cook a whole chicken and then it was my job to pick the unidentified chunky chicken floaters out of the stock. I guess if people are looking to save a buck they could do this instead. That is so true, but the chicken floater idea is gross! I like a nice clean (healthy)broth for my soup though!